A few months ago I wrote about acceptance and what a long road this can be for people following diagnosis. . 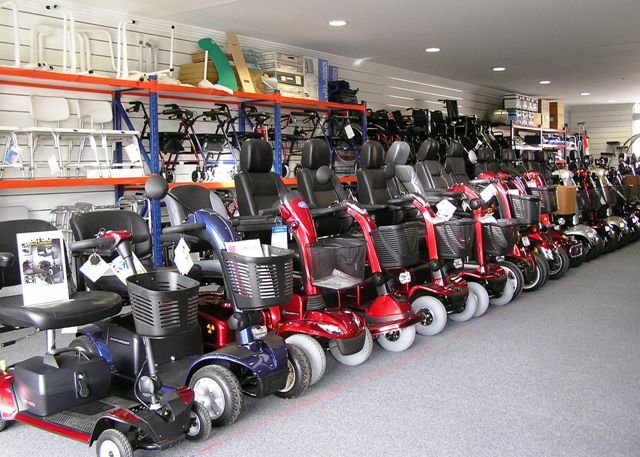 So I went down to a local mobility shop to see if I could find one and see what advice they could give me. I went in there full of hope and excitement and left in tears! “But I need to be able to do it on my own, that’s the point” I said in dismay! “Well, you won’t be able to take it in the car for days out but you can pootle to the shops in it” Honestly! Did she rehearse being so patronising! My bottom lip was quivering by this point so she went for the jugular. “Most people who come in here are people whose mobility is slowly decreasing, not someone like you and the stage you’re at” She then put on her best, sympathetic smile. 1) How does she know what “stage” I’m at without knowing the first thing about me? 2) How does she know what our budget is? 3) Does she want to sell me something or not? “Right then” I said, and walked out in tears! I felt crushed. It’s taken me 2 days of misery to get over it! It took a lot of guts for to face up to needing mobility aids and she set me back 2 years in one conversation! Luckily, I’m not the sort of person to give up! I have great support from people who know what they’re talking about and have decided to go for the Travelscoot. A lightweight one the folds up and goes in the boot!! It’s pricey but I’m hoping for a grant from the MS society to help with the cost. I will then go back to the shop with it folded into its bag and shove it up her…………..Nose! 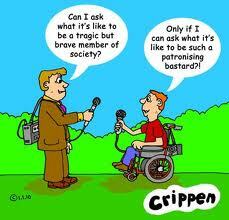 ← Disability Hierarchy and discrimination?? ?